The Seed Exchange Program is available to the general public. Please note that while NON-MEMBERS MAY ORDER SEEDS FROM THIS LIST, where quantities are scarce, CPS members’ orders will have priority. The Seed Exchange Program is interested in receiving seeds of both common and uncommon peonies. Before you dead-head your plants consider letting a few go to seed. It is desirable to know the name of the plant from which the seed is collected, so kindly keep track of this information. Where the name of the plant is unknown, a brief description is useful. Carpels (seed pods) should be left on the plant to ripen at least to the point where the pod starts to split. When the carpels are nearly fully open, collect the seed. Place seed in an open paper (not plastic) container, such as an envelope or small bag, to dry for a week or so. If you don't do this, the seed may get moldy after being wrapped for mailing. Lastly, place seed into small labeled envelopes and seal. If possible wrap envelopes in bubble wrap before placing in mailing envelope. Last year’s listing was a success with 797 seed packets being sent out to 29 buyers. Their gardens will soon be showing seedlings. This year we are again fortunate in having our generous American friend Mr. Gregory Rockwell sending over 1000 Chinese and Japanese tree peony seeds. Our most distant donor was from British Columbia. We now have seeds of pedigreed crossings from three members and I encourage more members to contribute in this way. At 202, this listing is an all time record. There should be plenty of seeds to go around but order early to be more certain of getting your selection. THIS YEAR I WILL AGAIN CLOSE OFF THE EXCHANGE AT THE END OF APRIL. There are usually very few requests after that time. Price is the same as last year $1.00 (see below) per packet, but the number of seeds varies according to how many seeds of each type were donated. As always a number of donations were in very small quantities (as that’s all the plant produced), so rather than having only one packet of 5 or 10 seeds, I distribute these in smaller quantities to spread the seed in more directions. I do try to have a minimum of 5 seeds per packet for most items where reasonably possible. Thus sometimes there are only a few packets available; these items are marked with an asterisks*; and you may only order one of each of these. Listing alternatives is advisable as I will have to substitute in many cases due to the limited supply available. NON-MEMBERS MAY ORDER SEEDS FROM THIS LIST but where quantities are scarce members’ orders will have priority. Send your list (PLEASE WRITE BOTH ITEM NUMBER AND NAME) of requested seeds to: Canadian Peony Society Seeds c/o Bill Wegman, 5441 Hilltop Dr. Manotick, Ontario, Canada, K4M 1G6. As stated, please list a few alternatives as supply is limited. If you would like instructions on germinating peony seed, please ask and it will be sent with your seeds. You may certainly order more than one packet of any item except those shown with an asterisk*. Enclose a cheque or money order payable to the Canadian Peony Society to the address listed in ORDERING. It is not advisable to send money through the mail. This year I will again accept postage stamps and Canadian Tire money on small orders. Remember to include your mailing address. Better still PLEASE ENCLOSE A MAILING LABEL. This will save me time and avoid error. $2.00 per packet, plus $2.00 per total order to a foreign address. For example, order 4 packets, the cost is $4+$1=$5 to a Canadian address. Please note that phytosanitary certificates are not possible. HERBACEOUS SPECIES (all are garden origin, open pollinated unless otherwise stated; packet contents as indicated). 2. P.caucasica [5seeds] BHN,CM single red. 3. P.humilis [6 seeds] BHN single pink. 4. P.kavachensis [5seeds] CM,SL single red. 8. P.officinalis [5seeds] BW single magenta. 9. P.officinalis ‘Villosa’ [5seeds] CM single pink. 14. P.delavayi [3seeds] BW single yellow. 24. American hybrid seedling Mix [5seeds] BW various. 25. Cherry Blossoms [5seeds] GR semi-double pink. 26. Da Zong Zi [5seeds] GR double red/black flares. 27. Dojean [5seeds] GR semi-double white/red flares. 28. Ezra Pound [5seeds] GR semi-double blush white/maroon flares. 29. *Guardian of the Monastery [3seeds] GR single lavender/purple flares. 30. Hana Kisoi [4seeds] GR semi-double pink. 31. Hong Lian [3seeds] GR single pink/red flares. 32. Hua Hu Die [3seeds] GR semi-double pink/purple flares. 37. *Qing Long Wo Fen Chi [3seeds] GR single pink. 38. *Shan Hu Tai [3seeds] GR double red/purple flares. 39. *Shi Ba Hao [3seeds] GR semi-double pink/maroon flares. 43. Shin Kumagai [4seeds] GR semi-double white/red flares. 44. *Shintenchi [3seeds] GR double pink/red flares. 45. *Taiyo [2seeds] BW semi-double red. 46. Taiyo seedling [4seeds] BW semi-double pink. 47. Xue Lian [4seeds] GR single white/purple flares. 48. *Yae Zakura [3seeds] GR semi-double pink. 49. *Yang Luo Boa Zhu [3seeds] GR double rose. 50. *Yan Long Zi Zhu Pan [3seeds] GR double red. 52. *Akashigata [3seeds] BHN,TH Japanese pink. 53. *Alexander Woollcott [2seeds] BW semi-double red, hybrid. 55. Anemoneflora Rosea [5seeds] SL Japanese rose. 56. Archangel [5seeds] BW single white, hybrid. 57. Barrington Belle [5seeds] HP Japanese red. 58. *Bernice Carr [5seeds] BHN semi-double pale pink. 59. Betty Warner seedling #97-3 [5seeds] BP single speckled pink. 60. Bev [5seeds] BM,RP double silvery pink . 62. *Capital Dome [4seeds] BHN double white. 65. Cincinnati [5seeds] BHN double pink. 66. *Clown [3seeds] BHN single pink. 67. Color Magnet [6seeds] BW,BP,SL single pink, hybrid. 69. Dawn Glow [4seeds] BW,SL single ivory ,hybrid. 72. *Doreen 4seeds] BHN Japanese pink. 73. *Do Tell [2seeds] SL Japanese light pink. 75. Empress of India [4seeds] BM double white. 76. *Evening Glow [2seeds] CM semi-double light pink. 77. *Exotic [3seeds] RP semi-double pink. 78. *Fiery Crater [3seeds] RP single dark red. 79. *Fragrans [4seeds] BHN double red. 81. *Gay Paree [4seeds] BW Japanese magenta. 82. *George Vorauer [3seeds] BHN single red. 83. Gertrude Allen [5seeds] BW Japanese white. 85. Glowing Candles [5seeds] BW Japanese pale pink. 86. Golden Frolic [5seeds] BHN single soft pink. 91. Gratis Seedling [5seeds] BP single lavender. 92. Harriet Olney [5seeds] TH single pink. 93. *Horizon [3seeds] BHN single flesh pink. 94. *Irene May Gilbert [4seeds] BHN single pink. 95. *James Pillow [4seeds] TH double light pink. 96. *Jan Van Leeuwen [4seeds] BM Japanese white. 97. Jappensha-Ikhu [3seeds] SL Japanese red. 99. John Simkins seedling mix [6seeds] CM,HP various. 100. *Josef Halda seedling #JJH146 [1seed] CM single white. 102. *June Rose [4seeds] BHN double rose. 103. *Kelway’s Bridesmaid [3seeds] BM double pink. 104. Kickapoo [5seeds] BM single red. 105. Krinkled White [5 seeds] BM,RP single white. 106. Lemon Chiffon [4seeds] BW,TH semi-double lemon yellow, hybrid. 107. Leto [4seeds] BM Japanese white. 108. Lotus Queen [5seeds] BM Japanese white. 109. *Lovebirds [3seeds] BHN single white. 110. *M. Adam Modzelewski [4seeds] BM double velvety red. 111. *Mme Jules Dessert [3seeds] BM double white. 113. *Martha Reed [2seeds] BHN double white. 114. Martha W [6seeds] BW,BHN single pink. 115. *Mary Contrary [4seeds] BM single warm white. 117. Maurice Menard Seedling Mix[6seeds] BM single cream/pink ,hybrid. 118 Meadow Lark [5seeds] BHN Japanese light pink. 119. Milton Jack [5seeds] BHN,BM double rose-red. 120. Minnie Shaylor [6seeds] TH,BW semi-double white. 121. Minnie Shaylor Seedling [4seeds] TH single white. 122. *Mischief [5seesd] BM single pink. 126. *Mr. Thim [4seeds] BM single red. 127. *Mrs. Wilder Bancroft [5seeds] BM Japanese red. 129. *Nellie Saylor [3seeds] BM Japanese red. 130. *Neon [4seeds] BP Japanese pink. 131. *Nice Gal [5seeds] BP double pink. 132. *Nippon Beauty [3seeds] TH Japanese red. 133. No Name Fragrant [5seeds] HP single pink. 134. No Name Pink [5seeds] TH single pink. 136. Orchid Annie [5seeds] BHN double light pink. 138. *Philippe Revoire [4seeds] BP double red. 139. *Picotee [3seeds] BW single pale pink , hybrid. 140. Pink Cameo [5seeds] TH double pale pink. 141. Pink Dogwood Whisper [3seeds] TH single pink. 142. *Pink Platters [2seeds] BHN semi-double pink. 143 Pink Princess [5seeds] BHN single speckled light pink. 144. *Pink Spritzer [4seeds] BHN single green/rose/cream. 145. Pink Vanguard [5seeds] BW, RJ semi-double pink, hybrid. 146. Port Royale [5seeds] BP,BHN Japanese red. 147. President Lincoln [5seeds] RP,BM single red. 148. Pride of Blasdell [5seeds] BM, TH Japanese rose-pink. 149. Pride of Langport [5seeds] BM, TH single pink. 150. Pico [4seeds] BM single white. 151. *Primevere [4seeds] BM Japanese blush-white. 152. Prosperity Maud [4seeds] BM single apricot, hybrid. 155. Roselette’s Child [5seeds] BM,RJ,BHN single blush ,hybrid. 156. Roy Pehrson’s Best Yellow [5seeds] BHN,RJ,BW,CM single pale yellow, hybrid. 157. Roy Pehrson’s Best Yellow Seedling [5seeds] BM,BW single pale yellow, hybrid. 159 *Santa Fe [4seeds] BM semi-double red. 160. *Serene Pastel [2seeds] BHN double pale pink. 161. Shaylor’s Sunburst [5seeds] BM Japanese white. 162. Silver Dawn F3 [5seeds] CM single white. 163. Soft Apricot Kisses [4seeds] GR single pink, hybrid. 165. Sonia Helene seedling[5seeds] BW single red, hybrid. 166. *Spellbinder [4seeds] BHN single white. 167. Stardust [5seeds] RP single white. 168, *Starlight [3seeds] CM single white. 169. Strawberry Wine [4seeds] BHN,SL single red. 172. Sunny Girl [3seeds] BHN double pale yellow. 174. *The Nathans [4seeds] BM double pink. 175. Topika Garnet [5seeds] TH single red. 178. *Virginia Dare [3seeds] BM single white. 180. Walter Mains [5seeds] BM Japanese red. 181. White Cap [5seeds] RP Japanese red. 182. White Wings [6seeds] HP single white. 183. *Xue Yuan Hong Hua [2seeds] double white. 184. *Yellow King. [3seeds] TH Japanese pale pink. The following are controlled crosses or seedlings from controlled crosses of members’ breeding programs. The descriptions are a best guess what to expect from the seeds. 192. Seedling 2001-393 peregrina ‘Sunshine’ x officinalis ‘Mollis’ [5seeds] RJ single pink, hybrid. 195. *Seedling IT 58 unnamed lactiflora seedling from Irene Tolomeo. Good for Itoh hybrids [2seeds] RJ white semi-double. 196. Seedling ‘Pink Princess’ x ‘Mme Jules Dessert’ [5seeds] BP single ruffled pink,hybrid. 200. *Cross 1534 ‘Lemon Chiffon’ x ‘Salmon Dream’ [3seeds] BW semi-double pale yellow,hybrid. Good Luck with your selections. Please remember to include alternatives or I will have to surprise you! La liste des échanges de l’année dernière a connu un véritable succès: 598 paquets ont été envoyés à 29 acheteurs. Leurs jardins exhiberont bientôt ces semis. Cette année, nous sommes vraiment chanceux. Un bon et généreux Américain nous a envoyé plus de 900 graines de pivoines arbustives chinoises et japonaises. Notre donateur le plus distant vient de la Finlande. Nos donateurs canadiens nous ont envoyé moins de graines que l’année dernière, mais Reiner Jakubowski nous a honorés avec des graines précieuses de son propre programme d’hybridation. J’ai ajouté plusieurs des miennes. Cette année, je terminerai l'échange à la fin d’avril, car il y a généralement très peu de demandes après cette date. Le prix est le même que l’année dernière, soit 1,00 $ le paquet (voir ci-dessous), mais le nombre de graines varie selon les quantités données pour chaque type. Comme d’habitude, un certain nombre de dons contiennent de très petites quantités (soit tout ce que la plante a produit en tout). Alors, au lieu d’avoir un seul et unique paquet de 5 ou 10 graines, ces graines ont été réparties par petites quantités dans plusieurs paquets afin de les disperser dans le plus de directions possible. Lorsque cela est raisonnablement possible, il y a un minimum de 5 graines par paquet pour la plupart des variétés. Ainsi, il se peut que la disponibilité soit seulement de quelques paquets; ces variétés sont marquées d’un astérisque*, et vous ne pouvez commander qu’un seul paquet pour chacune d’entre elles. Il est recommandé d’indiquer des seconds choix, car il faudra faire des substitutions dans plusieurs cas où les quantités sont limitées. Quoique les NON-MEMBRES PEUVENT COMMANDER DES GRAINES DE CETTE LISTE, là où les quantités sont rares, les membres auront priorité. Tel que spécifié, et en raison des quantités limitées, veuillez faire une liste de vos deuxièmes choix. Si vous désirez recevoir de l’information sur la façon de procéder pour faire germer les graines de pivoine, veuillez nous en faire part; nous vous ferons parvenir les instructions avec vos graines. Vous pouvez certainement commander plusieurs paquets par variété à l’exception des items marqués d’un astérisque*. Votre Paiement: Veuillez inclure un chèque ou un mandat fait à l’ordre de la Société canadienne de la pivoine. Il n’est pas recommandé de faire parvenir de l’argent par la poste. Encore cette année, nous acceptons les timbres postaux et l’argent Canadian Tire pour régler l’achat de petites commandes. N’oubliez pas d’indiquer votre adresse de retour. Mieux encore, envoyez une étiquette avec votre adresse postale avec votre commande. C’est la meilleure façon de gagner du temps et d’éviter des erreurs. Le coût est 1,00 $ le paquet, plus 1,00 $ pour toute commande en provenance du Canada; dans le cas des commandes à l’extérieur du Canada, le coût s’élève à 2,00 $ le paquet, plus 2,00 $ additionnels par commande étrangère. Par exemple: pour une commande de 4 paquets, le coût est de 4,00 $+1,00 $= 5,00 $ pour le Canada. Nous ne fournissons pas de certificats phytosanitaires. BHN – Blossom Hill Nursery, Peterborough ON; BM – Blaine Marchand/Jamie Roberston, Osceola ON; BP –Brian Porter, Regina SK; BW – Bill Wegman, Manotick ON; CM – Carter Moore, London ON; GR – Gregory Rockwell Granger, Indiana USA; Holly Pender-Love, Trail, BC; JH – Joe Harvey, Victoria BC; NG – Nova Gardens, North Saanich BC; RJ – Reiner Jakubowski, Waterloo ON; GT - RP – Rena Preston, Pickering ON; SL – Sharon Lanigan, Saskatoon SK; TH – Tom Harris, Warkworth ON. Vous trouverez ci-dessous la liste des graines provenant d’un croisement entre les graines du programme de nos membres. Les descriptions ne sont que des conjectures sur ce qu’on peut attendre de ces graines. Bonne chance dans vos sélections. N’oubliez pas d’indiquer vos seconds choix, sinon je devrai vous faire des surprises… N’oubliez pas de joindre, s’il vous plaît, une étiquette postale (si vous en avez une) ou votre adresse de retour. Veuillez prendre note que les envois se font en fonction de l’ordre d’arrivée (votre lettre ainsi que votre paiement). Premier arrivés, premier servis! Si nécessaire, nous procéderons par tirage au sort. Ceci assurera l’équité. Peonies are heterozygous and do not come true from seeds. Named cultivars must be propagated vegetatively to retain their cultivar name. Seeds collected from species plants have an inherent variability within the population and not all are exactly alike, even in nature. Be aware that species plants grown in the garden are subject to cross pollination with other peonies that may be in bloom at the same time, but otherwise, plants grown from species seeds remain species plants. Peony seeds can be started indoors, but it's a rather involved process and it has to be started in the fall to get the timing right for planting sprouted seedlings in the spring. 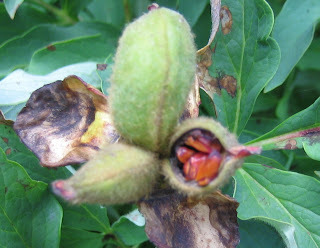 By late winter it is much better to delay starting peony seeds until mid-June, perhaps as late as mid-July. The reason for this is that peony seeds have a stepped approach to germination which has evolved to maximize sprouted seeds emerging in the spring when they have the best chance for survival. Seeds need a lengthy warm moist period after which the root starts to grow with the onset of cooler fall weather. The cold of winter is needed to break down barriers which otherwise prevent initiation of shoot growth. This sequence of environmental factors must occur in that order, or the seeds will not grow. 1. In mid-June to mid-July soak the seeds in water for up to four days. Seeds which sink are considered sound and should germinate for you. Seeds which never sink are usually hollow, and not viable. 2. Plant out in garden, or in a cold frame, 1 inch deep, 4 to 6 inches apart. 3. Water to dampen the soil, and avoid letting it dry out, but don't keep it constantly wet either. 4. It is best to cover the seeded area to conserve moisture, to mark the spot, and to protect against animals digging them up. They won't show above ground growth until the following spring, so covering won't bother them. Use a board or flat rock or something similar. 5. Remember to remove covering as early as you can in the spring. Collect seeds as pods begin to open. The harder the outer shell, the longer the first dormancy period. Wash the seeds in soapy water, followed by a ten minute soak in a solution of 9 parts water to 1 part household bleach. Rinse. Seeds that have been stored, soak in clean water from one to four days. Change water at least daily. Seeds that remain floating are considered hollow, or otherwise incomplete, and unlikely to germinate. Seeds that sink to the bottom should be okay. Use these as you continue with the next step. Place seeds in sealed plastic bag with barely moist vermiculite or peat moss. Leave them in the warmth until the roots appear (anywhere from a few weeks to several months). After 12 weeks, remove the bag and pot up the partially germinated seeds in a soil-less germination mix. Depending on the time of year, you may have to place seedlings under grow lights for a few months before being able to transfer outside. Keep seedlings under grow lights and ensure they are moist but not soggy. Apply a balanced liquid fertilizer every few weeks. Transfer outside slowly as you would any other tender seedling. Too much sun, too rapidly, will result in burnt foliage. Seedlings should be outside in a sunny well-drained seedbed by September at the latest.